The Moffatts will hold a one-night-only show in Cebu to mark the 20th anniversary of their last concert in the country as a four-piece group. Almost two years since their Farewell Tour in Manila, four-piece Canadian pop-rock group The Moffatts composed of brothers Scott, Clint, Bob, and Dave Moffatt will once again reunite for a one-night-only show in the country this November. On Facebook, local events promoter Prima Vera Event Management announced that the ‘90s boy band is set to mark the 20th anniversary of their last concert in the Philippines as a quartet with a show in the Queen City of the South—Cebu. "After 20 years, the four Moffatt brothers are once again reunited and are coming back to Cebu for a show that takes you on a nostalgic escapade," wrote the local concert promoter in a post, confirming the return of the iconic ‘90s group. Likewise, Midas Promotions have also posted the announcement. The Moffatts rose to fame in the ‘90s and made their mark on the Philippine market with several hit songs including “I’ll Be There For You," “Miss You Like Crazy," “If Life Is So Short.” and so much more. 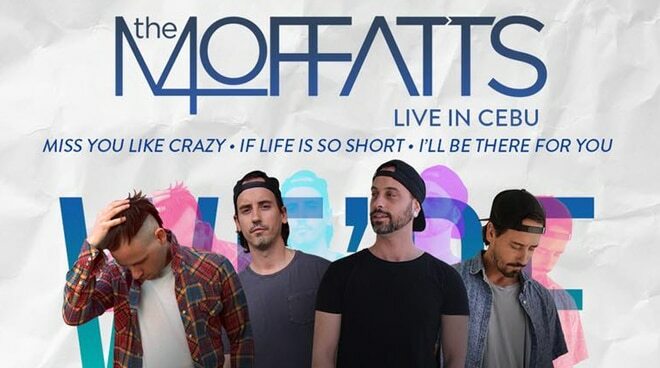 The Moffatts Live in Cebu is happening on November 23, 2018 at the Hoops Dome Arena in Lapu-Lapu City, Cebu.